I know this may sound weird but we can’t tell you how many gallons per minute your pump pushes based off of your motor alone. When asked, we reply with, “I’m not sure, but if you provide the make and model of your pump, I can review your pool pump curve.” That answer usually confuses some pool owners. Truthfully, the confusion stems from confusing the motor for the pump, or vice versa. To some, the words are interchangeable, however, they are not. Your motor is just a single component of your pump. Think of it as the engine in your car. The word pump includes your motor but also the pump housing, impeller, diffuser, strainer basket, and lid. For this reason, it impossible for us to know the GPMs of your pump based off of the motor alone. Now that you have the make and model of your pump, how do you determine the GPMs? The answer: a pool pump performance curve. What Is a Pump Curve? Each manufacturer performs a series of tests at the factory to collect this data. 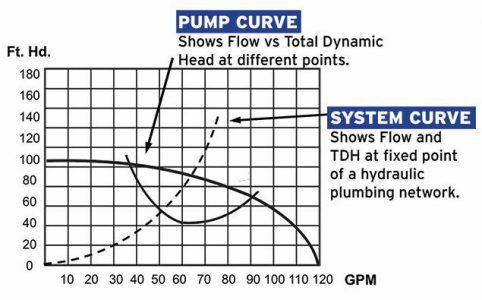 Each curve varies from pump to pump which means you cannot rely on a different pump’s performance curve, even if you share the same motor. In addition to the horsepower of the motor, the size and shape of the impeller also affect the curve. 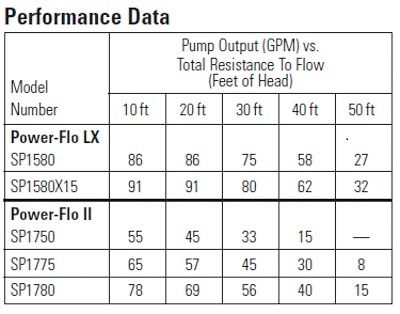 In short, all of the components within the pump affects the performance curve. The information on your motor alone cannot tell you how many gallons per minute your pump pushes. You really need only two pieces of information in order to read a pump flow chart: the pump model number and the feet of head. Of the two, the pump’s model number should be easier to locate. In our experience, pool owners get most hung up on calculating their feet of head. The feet of head, or total dynamic head, refers to the total equivalent height your water travels. It takes any friction loss in the pipes into consideration. Essentially, your feet of head is the measurement of resistance against your pool pump as it pulls water from your basin and pushes it back to the pool. If you need help measuring the length of your pipes, turns, and dips here is an in-depth guide to calculating your total feet of head. Once you can determine your total feet of head, write it down. Who knows, you may need this information again. Now, determining the total number of gallons your pump pushes per minute is a piece of cake. Simply follow the curve on the chart, one for your specific pump model and the other for your feet of head. Once the two lines intersect or touch, that number is your total GPMs. For a detailed example, check out our Inground Pool Equipment Selection Guide. In this video, Matt and Rob review what a pump curve is and how you read it. If you need help determining what pump model you have or you cannot locate your pump’s performance curve, do not hesitate to leave a message below. If you prefer to send us pictures of your pump, please send them to UPLOAD@INYOPOOLS.COM. I’m needing a spa pump for a new spa. It’s an in ground, 20 jet system with one 2″ and one 1.5″ supply lines. I’m thinking I will need a 5HP pump such as the Waterway Plastics #3722021-1D. I have all Pentair products such as lights, valves, etc. Question: Will a Pentair Easy Touch control panel operate this pump? Will I need a special relay for it to work? 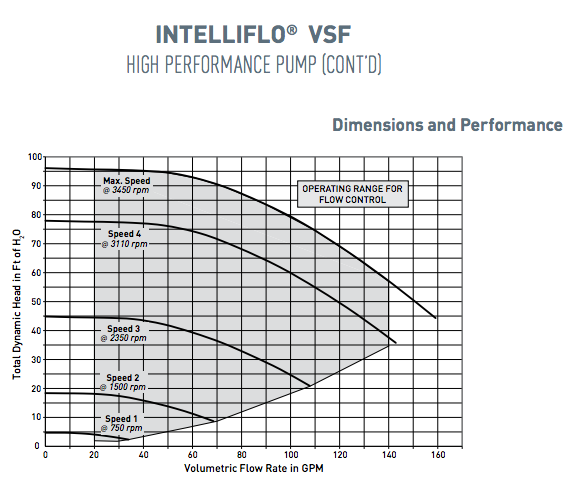 I have the Pentair Intelliflow VSF. 3hp vs. I have found the chart but I am confused. This is my first pool. I’ve calculated my feet of head to be around 65 (average length of all supply lines). 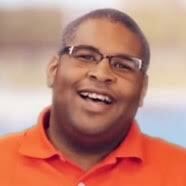 I have calculated my pool volume to be around 36,000 gallons. What I’m trying to figure out is what speeds will hit the minimum GPM flow that I need on my pool to turn the water over effectively. Everything that I’ve read says that I should turn the pool twice daily. If that is true, 50 GPM would be a minimum flow rate to shoot for. I just can’t see what the minimum approximate RPM I need in order to be at 50 GPM. Thanks for your help! All the IntelliFlo VSF flow charts resemble this one. The feet of head is on the y-axis, the flow rate is listed on the x-axis. Each line has a prescribed RPM and follows the flow expected for each feet of head. Using the two data points provided, 50 GPM and 65 feet of head, the approximate is 2600 to 2800 RPM. PSC Ep. 58: What is the correct orientation for my shaft seal?